A Christmas tea-table that will please both old and young is another charming and novel idea. For this, purchase a small wooden wheelbarrow, such as can be obtained at any toy shop, but if there is a clever home carpenter in the family it will not be a difficult matter to get it made at home. Enamel it a bright shade of scarlet, which is essentially a Christmas colour. Line it with moss, and place a glass jar - or tin that will hold water - inside it. Stand some lead supports in this, hide them with moss, and fill lightly with fragrant lilies of the valley and their leaves. Place this on the centre of the table upon sprays of fern and moss, and stand a knowing-looking robin on the barrow. Then place your Father Christmas so that he appears to be wheeling the barrow. Father Christmas, to the guests, will look an elaborate figure, but he began life as a very ordinary sixpenny one, and was beautified by the home worker. A big beard was made with some scraps of white fur, a pointed cap of red Turkey twill trimmed with a band of white wadding, and a long coat of the same material trimmed to correspond. 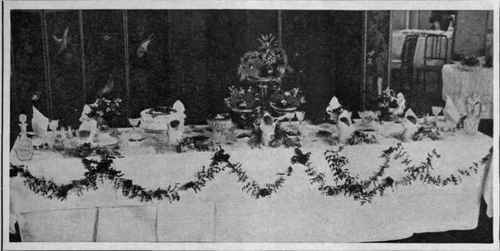 Around the table are Yule log cosaques, ornamented with sprays of holly and fir. Take a strip of white wadding, and pull the surface loose until it is a fleecy mass, which will form a good imitation of snow. In the centre of the snow stands Father Christmas, with a holly bough in his hand, or holding a banner with good wishes painted upon it, his robin by his side. Under the snow around him place the presents, tied in neat parcels, and attach a length of scarlet ribbon to each parcel. Hide the edge of the wadding with sprays of holly. Bring the ribbons out in all directions, and place the end of one before each guest's seat. Write the names of the guests in red ink on holly name-cards, and attach them to the ribbons with a pretty bow. At a given signal each guest draws a ribbon, and finds an appropriate little present at the other end. For the sweets fill little rustic wheelbarrows with cocoanut creams in the shape of marbles to represent snowballs, and perch a tiny toy robin on each barrow. Although elaborate table-centres are not largely used now, the tablecloths themselves are far more elaborate than formerly, and When they are inserted with beautiful lace, as is very often the case, it is, of course, a mistake to hide this with decorations. A coloured underslip is used sometimes with these openwork or lace-trimmed cloths, and the effect is very good if the same hue as the flowers is employed. Ivy and robins are a delightful combination for a Christmas table. A square of white silk that has been embroidered with a design in floss silk and silver thread is placed under a handsome centre-piece filled with luscious fruits, white chrysanthemums and asparagus fern. 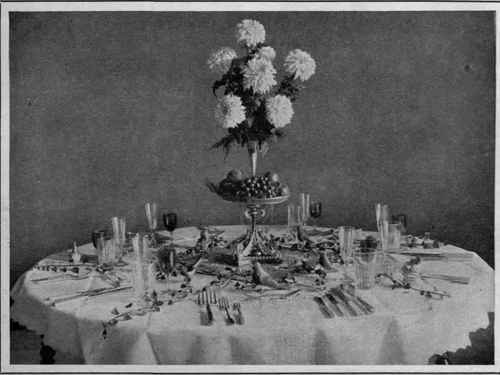 The white silk square is bordered with sprays of fine ivy leaves, and the sprays cross at each corner; other sprays extend from the centre to the edges of the table, and they have all been frosted. A robin filled with sweeties is placed in front of each guest. If you are decorating the table for a buffet or stand-up supper, garland the front and sides with smilax, fastening a pretty cluster of Parma violets where the smilax garland is caught up. Some little joy bells hanging from ribbons would be appropriate between the festoons. To make the violet chains, strip the blossoms from their stalks, and thread them carefully on to lengths of cotton. The cotton must be strong enough to hold the weight of the blossoms, but not so coarse as to break the delicately poised petals. The dessert doyleys are an important part of the table decorations nowadays, and the wise hostess will make her own and let originality be their keynote. For the robin and ivy table nothing would be prettier than white silk cut out in the form of large ivy leaves and buttonhole stitched with ivy-green silk. "Two pigeons flying high, Chinese vessel sailing by; Weeping willow hanging o'er, Bridge with three men - if not four; Chinese temple, there it stands, Seems to cover all the land; Apple-tree with apples on, A pretty fence to end my song." 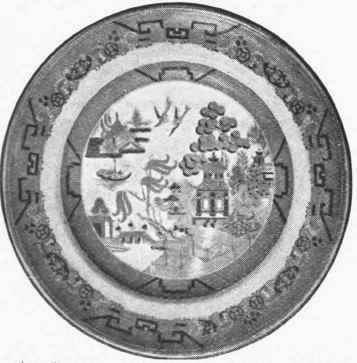 "Thus runs the fascinating little poem of the willow pattern, and the story is like unto it. Koong-Shee, a lovely Chinese maiden, bestowed her affections upon Chang, her father's secretary. Their meetings were discovered by the mandarin, who ordered his daughter to wed a wealthy suitor. Upon her refusal to comply, the enraged father locked her up in the little house seen upon the left side of the temple. Here the lovely maiden watched from her window the willow-tree blossom, and wrote poems expressing her longing to be free ere the peach bloomed.